Heel Protectors are important because heels are the part of your body that can really feel the pressure and pain while resting or sleeping. 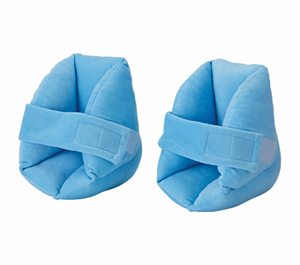 Cover and comfort them with wonderfully soft velour and cushion. Heel Protectors provide optimum and comfortable padding for the heels to protect them from discomfort and pressure sores and are great for use in bed, on the couch, or in a wheelchair. Heel Protectors feature extra-wide cloth straps with Velcro closure that are easy to adjust and keep heels secure and in place, super soft velour material with polyester fill, and reusable and washable. One size fits most. Color is light blue.